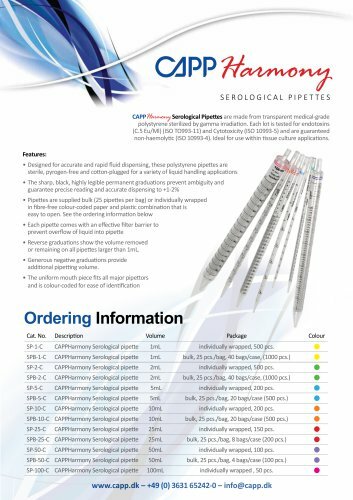 GdPP 'Harmony CAPPHarmony Serological Pipettes are made from transparent medical-grade polystyrene sterilized by gamma irradiation. Each lot is tested for endotoxins (C.5 Eu/Ml) (ISO TO993-11) and Cytotoxicity (ISO 10993-5) and are guaranteed non-haemolytic (ISO 10993-4). Ideal for use within tissue culture applications. Features: • Designed for accurate and rapid fluid dispensing, these polystyrene pipettes are sterile, pyrogen-free and cotton-plugged for a variety of liquid handling applications • The sharp, black, highly legible permanent graduations prevent ambiguity and guarantee precise reading and accurate dispensing to +1-2% • Pipettes are supplied bulk (25 pipettes per bag) or individually wrapped in fibre-free colour-coded paper and plastic combination that is easy to open. See the ordering information below • Each pipette comes with an effective filter barrier to prevent overflow of liquid into pipette • Reverse graduations show the volume removed or remaining on all pipettes larger than 1mL. • Generous negative graduations provide additional pipetting volume. • The uniform mouth piece fits all major pipettors and is colour-coded for ease of identification Ordering Information Cat. No. Description Volume SP-1-C CAPPHarmony Serological pipette 1mL individually wrapped, 500 pcs. SPB-1-C CAPPHarmony Serological pipette 1mL bulk, 25 pcs./bag, 40 bags/case, (1000 pcs.) SP-2-C CAPPHarmony Serological pipette 2mL individually wrapped, 500 pcs. SPB-2-C CAPPHarmony Serological pipette 2mL bulk, 25 pcs./bag, 40 bags/case, (1000 pcs.) SP-5-C CAPPHarmony Serological pipette 5mL individually wrapped, 200 pcs. SPB-5-C CAPPHarmony Serological pipette 5mL bulk, 25 pcs./bag, 20 bags/case (500 pcs.) SP-10-C CAPPHarmony Serological pipette 10mL individually wrapped, 200 pcs. SPB-10-C CAPPHarmony Serological pipette 10mL bulk, 25 pcs./bag, 20 bags/case (500 pcs.) SP-25-C CAPPHarmony Serological pipette 25mL individually wrapped, 150 pcs. SPB-25-C CAPPHarmony Serological pipette 25mL bulk, 25 pcs./bag, 8 bags/case (200 pcs.) SP-50-C CAPPHarmony Serological pipette 50mL individually wrapped, 100 pcs. SPB-50-C CAPPHarmony Serological pipette 50mL bulk, 25 pcs./bag, 4 bags/case (100 pcs.) SP-100-C CAPPHarmony Serological pipette 100mL individually wrapped , 50 pcs.